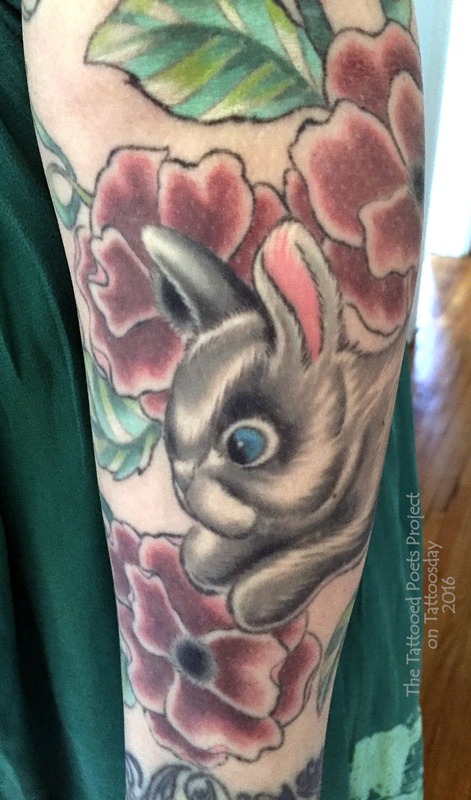 "This tattoo was done about a year ago, for my 28th birthday, by Jacob Hanks, who tattoos both in Portland, OR and out here at his smaller shop in The Dalles [Hanks Family Tattoo Co]. The line is from Anne Sexton's 'Hurry Up Please It's Time,' a poem that slays me with every single reading. My first relationship with Anne--high school years--felt traditional. I read her early stuff (Bedlam, All My Pretty Ones), and her confrontation of 'hard' subjects became a place of permission for me. I mean I can probably quote from Love Poems if put on the spot. I grew out of her work as I developed my relationships with more contemporary writers and poetics, and then I came back to her and found entire new worlds of appreciation--the beautiful frenzied thinking she can accomplish within a sentence. Her later stuff, including what's been published after her death, is more patient, much sadder, more directly suspicious of god in a way that prevents her from ever setting god down. She says, 'Abundance is scooped from abundance, / yet abundance remains.' It's a way to keep living." Sarah Cook is a poet. She lives in Oregon. Every year I feature at least one poet who I've met face-to-face and talked tattoos. This year, it's Kait Burrier, who I met last July at the NYC Poetry Festival on Governor's Island. "Brittany, France is covered in triskels. 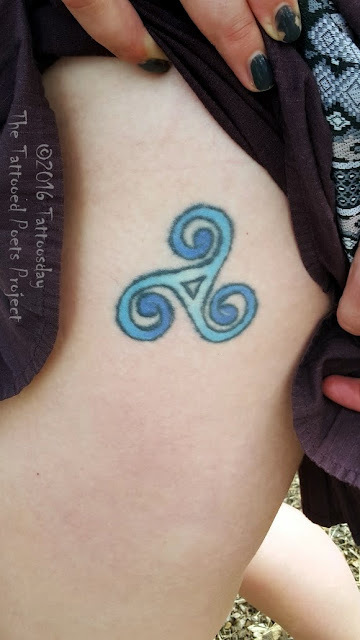 Scranton, PA artist Mike Frenchko, formerly of Slingin' Ink and now at Electric City Tattoo, drew up my tattoo after I'd shown him a few images of this Celtic symbol. 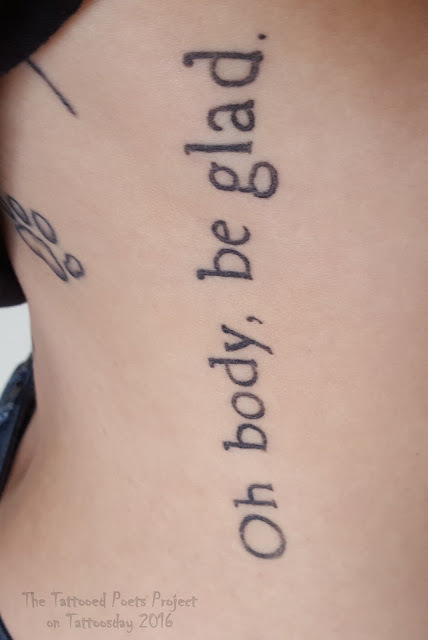 My tattoo brings me back to Quéven, a dreamy Breton seaside town with an incredible theater community that taught me about craft, communication, gratitude, and the tragicomedy of the human condition. 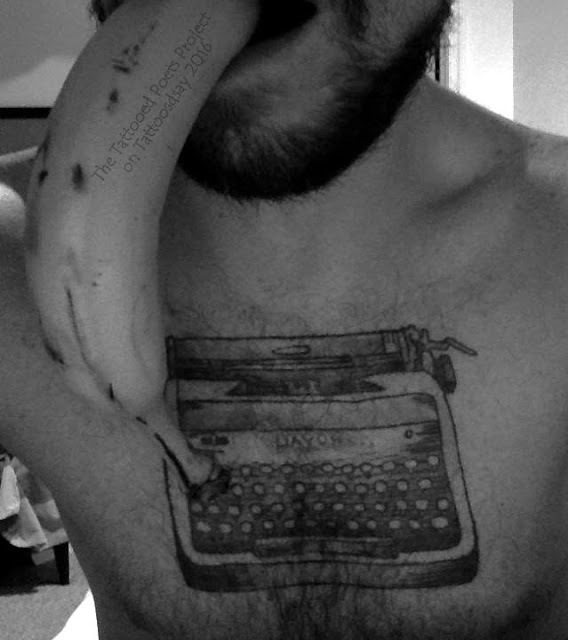 They gave me a souvenir clown nose, but I've misplaced it; a tattoo seemed harder to lose." Kait shared the following poem, which she wrote "in response to the William Carlos Williams poem The Young Housewife, reimagining a different scenario for his poem's subject." It appeared previously both in a zine printed by the Breaking Ground Poets and online at Inknode. Kait Burrier writes poetry, drama, and to-do lists. Since moving to New York City in 2014, she has facilitated workshops, shared her work at local venues and in college classrooms, founded and hosted Union Square Slam, co-hosted At the Inkwell reading series, volunteered with Out of the Binders, Inc, wrote as artist in residence at Lemons Brook Farm, and worked in publishing, bookselling, and as a freelancer. She holds a M.F.A. (Wilkes University, ’14) and received the 2013 Wilkes-Etruscan Press prize. Visit www.kaitburrier.com for updates and publications. 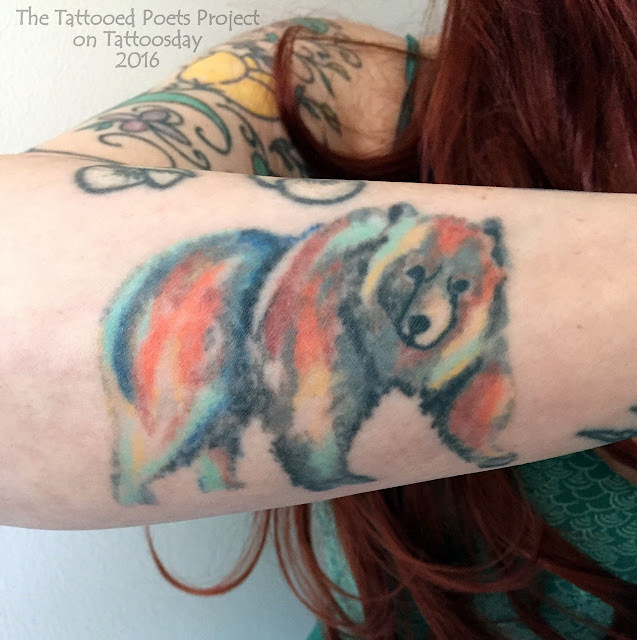 Thanks to Kait for sharing her tattoo and poem with us here on the Tattooed Poets Project on Tattoosday! "Seeking to remember the advantages I might carry into any situation, I had Lila at Rock City Tattoos (in Barre, Vermont) put these 'cards up my sleeve.' The Jack of Clubs represents 'the man in the woodwork,' the secret admirer working on my behalf without my knowledge. The Ace of Cups represents abundance of emotional resources; the Ace of Coins represents abundance of physical resources. La Sirena from the Mexican Loteria reminds me of Iemanja, the goddess of the sea, who nurtures me in many ways. And with those charms under my skin, I feel prepared for anything. 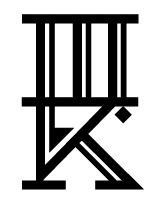 Above the cards on the right shoulder is a rough spiral, from the Egyptian hieroglyph for the verb 'to be.' 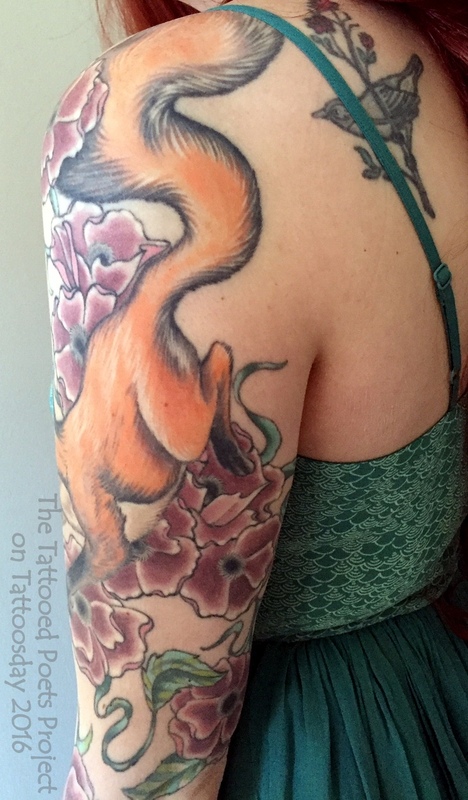 And around the left bicep is a feather armband to represent my Creek heritage." spider. Remaking tobacco with his right hand. To pacify the coiled serpent. tree. Help him bury them. scuppernongs picked with your fingers. red man, a great wizard united with another great wizard, to fail in nothing. Remake tobacco with the left hand in a counterclockwise direction. Chip Livingston is the author of two poetry collections, CROW-BLUE, CROW-BLACK (NYQBooks, 2012) and MUSEUM OF FALSE STARTS (Gival Press, 2010), and a short story/essay collection, NAMING CEREMONY (Lethe Press, 2014). His poems have appeared in Ploughshares, Prairie Schooner, New American Writing, and on the Poetry Foundation’s and the Academy of American Poets’ websites. Chip teaches in the low-rez MFA program at Institute of American Indian Arts in Santa Fe, NM, and at Regis University’s Mile High MFA in Denver, CO. Visit chiplivingston.com. 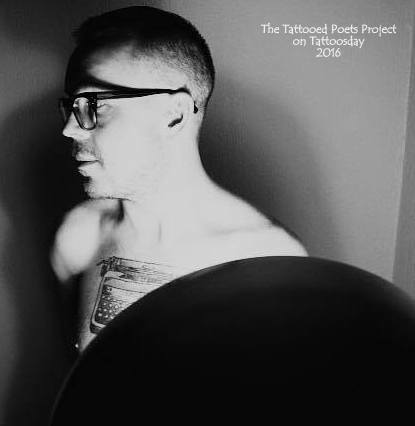 Thanks to Chip Livingston for sharing his poem and tattoos with us here on the Tattooed Poets Project! 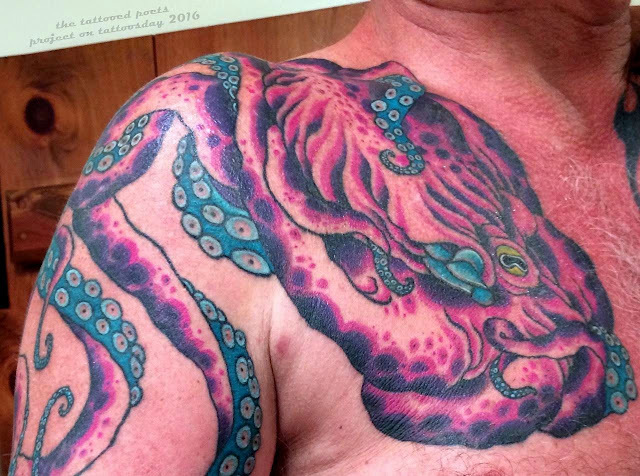 "Cephalopods have fascinated me since I first saw them in aquariums—how they can camouflage themselves by instantly changing color, how they can change shape to appear large and aggressive or to squeeze themselves down to hide in tight spaces, how they use jet propulsion and can zip away in a cloud of ink. And they are intelligent: I once read about an octopus in a tank at a research lab. The staff were puzzled by the nightly disappearance of fish from another tank across the room. So they set up video surveillance and were surprised to see the octopus lift the lid on its tank, crawl down and across the floor, then up into the fish tank where it enjoyed a midnight snack before crawling back to its own tank. There’s something admirable about that stealthy intelligence and cunning instinct to survive. 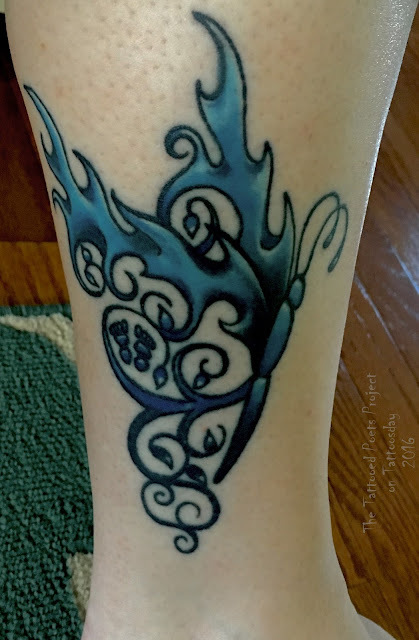 I’ve nine tattoos (thus far) and like to think of them as guardian totems. The octopus is one of my spirit animals. I worked with the very talented Jeremiah Loui (Instagram here) at Iron Works Tattoo in Portsmouth, NH to design this upper chest and shoulder piece for my right side to counterbalance a large tribal moko on my left. We worked from photos I found on the Internet. My only stipulation was that the design be colorful, massive, realistic, and 'non-threatening.' Jeremiah achieved exactly what I had envisioned. The tattoo was completed in about 10 hours over the course of three sessions." No planet could keep so many moons in tow. celestial path, must break into their midst. The poem above appeared in The Burning of Troy (BOA Editions, 2006). Copyright © 2006 by Richard Foerster. Reprinted by permission of the author. Richard Foerster was born in the Bronx, New York, and holds degrees in English literature from Fordham College and the University of Virginia. He is the author of seven poetry collections, most recently River Road (Texas Review Press, 2015). Foerster has been the recipient of numerous honors, including the “Discovery”/The Nation Award, Poetry magazine’s Bess Hokin Prize, a Maine Arts Commission Fellowship, the Amy Lowell Poetry Travelling Scholarship, and two National Endowment for the Arts Poetry Fellowships. Since the 1980s, his work has appeared widely in magazines and anthologies, including The Best American Poetry. He has worked as a lexicographer, educational writer, typesetter, teacher, and editor of the literary magazines Chelsea and Chautauqua Literary Journal. For the last 30 years, he has lived on the coast of southern Maine. Visit his page on Amazon here. 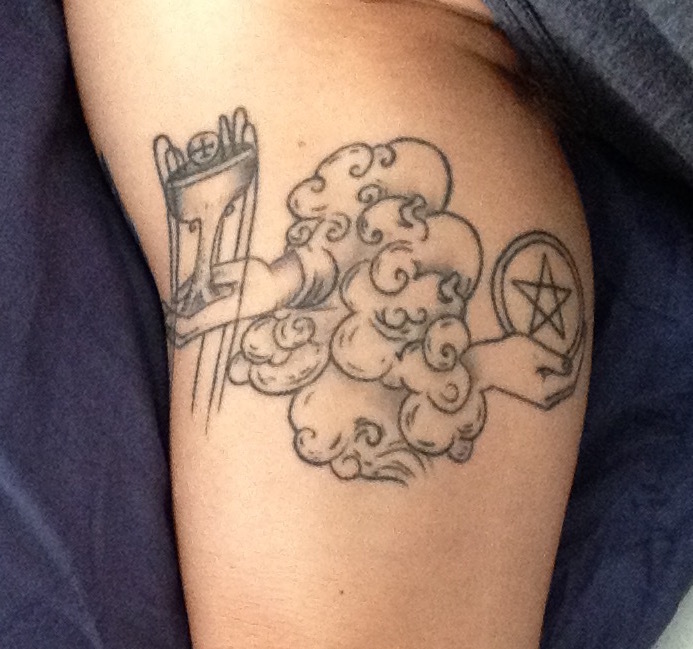 Thanks to Richard for sharing his awesome tattoo and poem with us here on Tattoosday's Tattooed Poets Project! "I wanted a butterfly to represent metamorphosis and becoming, and it's blue because that was my late brother's favorite color. The top wings are flames to represent my voice in the world - may the words I create be both a light to others and also burn with truth. The baby footprints are for my miscarriages. The bottom wings are vines to represent the creative power of women. This is not just the power to carry a child and give birth, but to also bring life-giving art into the world. 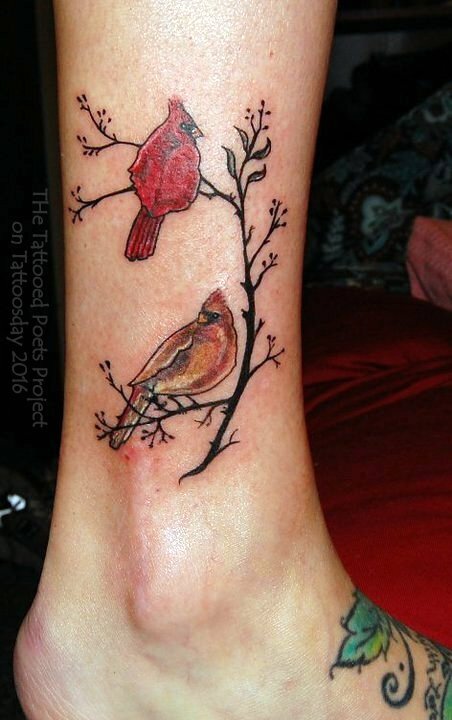 I love the symbolism of flight, feminism, and freedom in this tattoo! 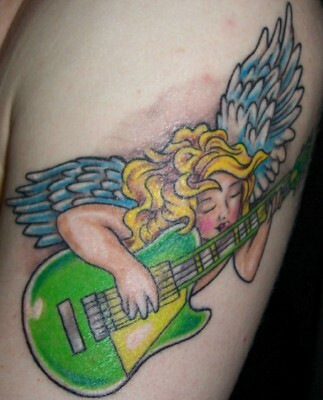 I got this tattoo at Needle Bent Tattoo in Gallatin, Tennessee. The artist did a great job of collaborating with me and creating what I wanted. Unfortunately I have forgotten his name." Karissa Knox Sorrell is a poet and ESOL teacher. She is the author of Evening Body, a poetry chapbook published by Finishing Line Press. 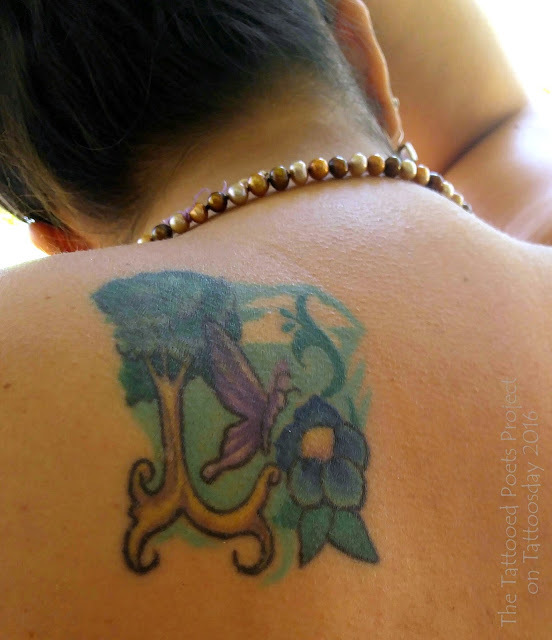 Her poems can be seen in literary journals such as Two Cities Review, Blue Heron Review, Gravel Mag, and Cactus Heart. 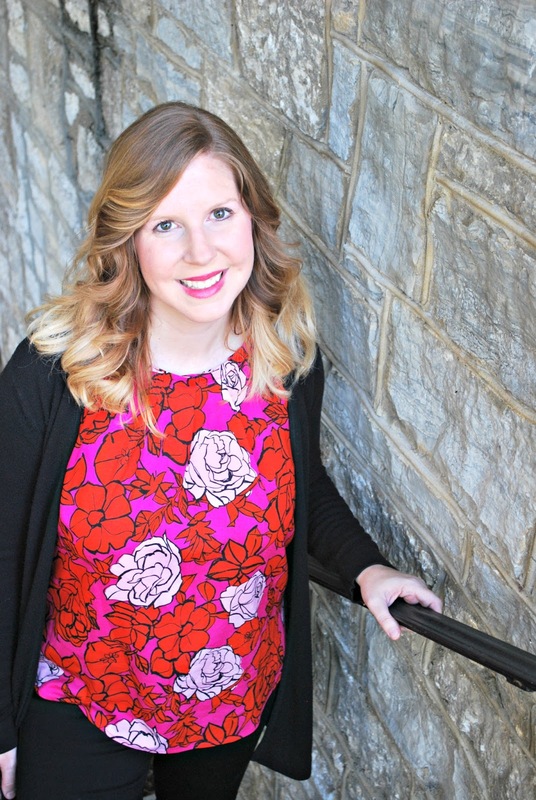 Karissa lives in Nashville, Tennessee, with her family of four. Read more about Karissa's work or buy her book at karissaknoxsorrell.com. Find her on Twitter @KKSorrell. 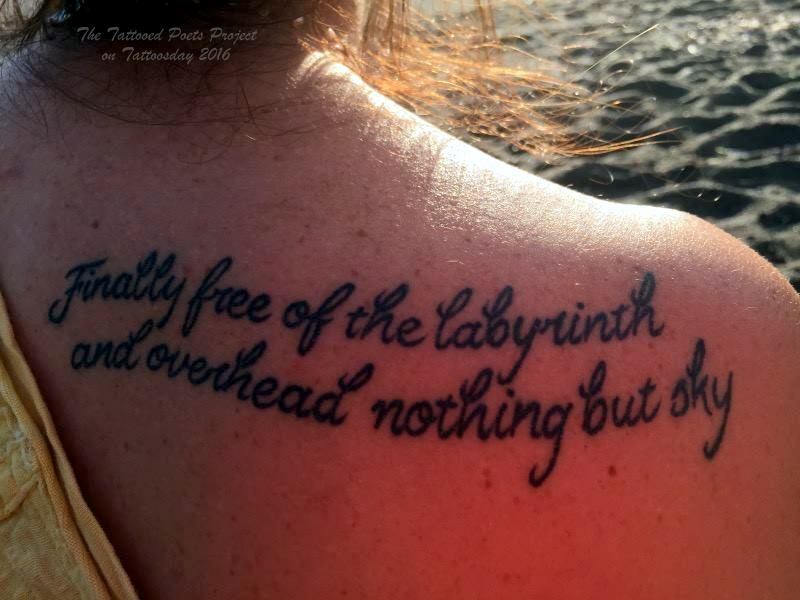 Thanks to Karissa for sharing her tattoo and poem with us here on Tattoosday!